"Almond milk and almond butter are the star ingredients in this berry smoothie for a nutritious, on-the-go meal that is vegan and paleo-friendly." Combine blueberries, banana, almond milk, and almond butter in a blender; blend until smooth, adding water for a thinner smoothie. Any type of frozen berry can be used in place of the blueberries, if desired. I make this same smoothie every morning for breakfast but I add 1/2 cup of OJ, and chia, flax and hemp seed...so good! So yummy! I added 1/4 cup of vanilla Greek yogurt to mine and used frozen mixed berries in place of blueberries. I also used unsweetened almond milk. I will make this one again and again!! 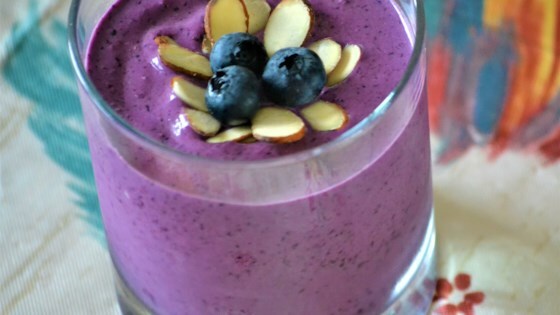 Delicious and easy smoothie! I added just a pinch of cinnamon to it, and that really added a nice flavor. This makes for a quick breakfast too! Thanks for the recipe! Very good and filling. I also added some protein powder and used only half of a banana. I like the taste the almond butter gives! Will make again. I did not have almond butter so i used regular smooth peanut butter, and did not add water.Always on the lookout for a good smoothie and this one did not disappoint. Thank you for the recipe. I totally loved this recipe. Initially I made it just as written. Lately I've been adding some zucchini to my green smoothies and have been very pleased with the results.